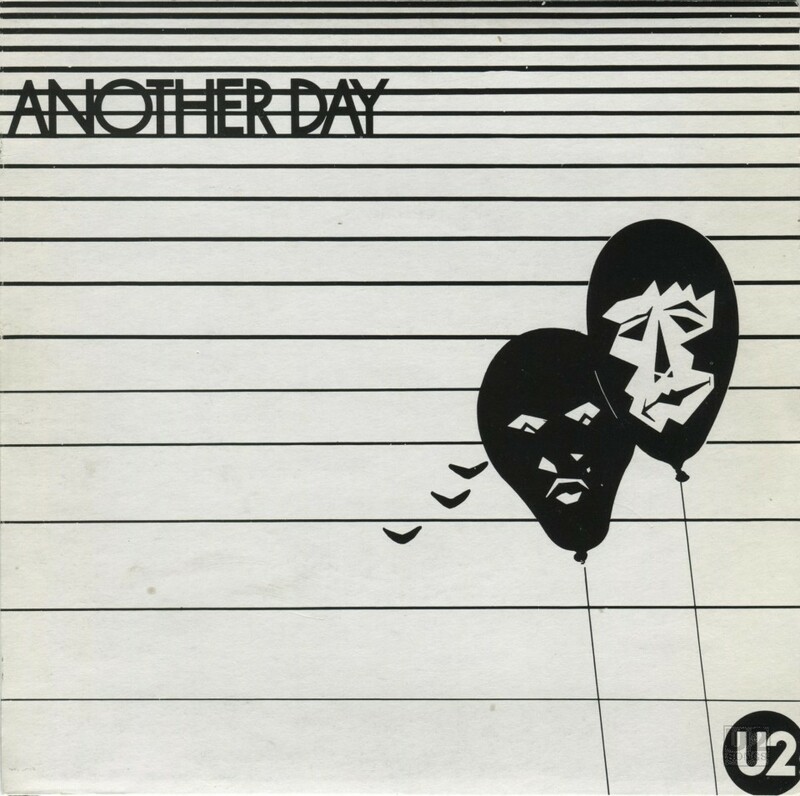 U2’s second single, the follow up to “U2 Three,” was 1980’s “Another Day.” It was originally released by CBS Records—but only in Ireland and only on 7-inch vinyl. It was later re-pressed as part of the “4 U2 Play Pac,” which collected early 7-inch singles together in a set of four. These re-pressings appeared not only on black vinyl, but also in a variety of colours including yellow, orange, white and brown. 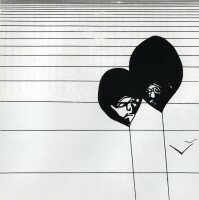 A limited number of the original 1980 copies of “Another Day” included a postcard featuring some doodles by Bono on one side (a reproduction of which can be found in the liner notes for the 2008 deluxe edition of Boy) and a picture of the band on the other side. “Another Day” has never been featured on a U2 album. The b-side, “Twilight,” however, was later re-recorded and released on Boy. “Another Day” was recorded with producer Chas DeWhalley, who had also worked with the band on “Three.” It was recorded the week of December 20, 1979 in a session at the Whitfield Street studio of CBS in London. (There are reports that another song, “The Dream is Over,” was also recorded during that same session, but it remains unreleased.) The band was scheduled to return to Dublin the next day, and Bono’s voice was suffering as a result of a long string of tour dates U2 had just completed, so he drank honey and tea during the session. The song was mixed by DeWhalley in London on December 26, 1979, with Bono providing input by phone from Dublin. The single version of “Twilight,” the b-side, was recorded at an earlier session, in February 1979. Although “Three“ had entered the Irish charts—likely due to the hype surrounding a limited edition, numbered 12-inch vinyl—this second single failed to chart. The release of “Another Day” was timed to coincide with a concert at Dublin Stadium on February 26, 1980, that was broadcast on RTE2 radio. While introducing the song during the show, Bono mentioned that the single was out on CBS, but predicted that it would not be out on that label for long. After that very concert, U2 signed their contract with Island Records, making “Another Day” the final single to be released only on CBS in Ireland. “Another Day” did not remain in the band’s live set for long, and in fact disappeared entirely by mid-1980. It has not been revisited on any tour since that time. “Twilight” fared much better in a live setting, and was played at most shows through the Boy, October and War tours. It was finally retired after a scattering of appearances in Australia in the early days of The Unforgettable Fire Tour. The label on some of the earlier pressings of “Another Day” list “A Break Records Production” under the song title on the label of the vinyl. This is the name of the production company that Paul McGuinness helped to set up to release Spud’s “Kitty” single in 1976 prior to his involvement with U2. That single was released on “Break Records” and was the only single listing Paul McGuinness as manager. That single by Spud was produced by Shaun Davey. Davey’s own single on CBS in 1978, “The Pride of the Herd” would also list “A Break Records Production” in the same location that “Another Day” does. Perhaps some thought was being given to reviving the “Break Records” name, if an international contract was not reached. Both “Another Day” and the single version of “Twilight” made their CD debut on the bonus disc included with the 2008 remastered deluxe edition of Boy. In the liner notes, Edge mentions that the original master tapes for “Twilight” had gone missing, so the track had to be sourced from vinyl for the CD release. “Another Day” was produced by Chas de Whalley and U2 at CBS London, December 1979. “We went on the boat”. Management Paul McGuinness. Dublin. 686553. Agency: Dave Kavanagh 714855. Thank you teddy Edwaed, God, bless Elsie and all the Village. Although credited to Bono, Steve Averill was involved in the sleeve as well. He spoke about the sleeve, “The second single sleeve for U2 started from a conversation with Bono about the mood of the song after which he did a drawing conveying the atmosphere that he wanted for the cover. While I would have been happy to use the drawing as it stood he asked me to have a go at ‘cleaning it up’, I did that while at the same time trying not to deviate too far from the spirit of the original. Using a straight edge, I redrew the lines of the sky to get a clearer divide from ‘dark to light’ and on the balloon images I added greater definition to the faces. The main face within the balloon is based on Conrad Veidt’s face in Robert Wiene’s 1919 film “The Cabinet of Dr. Caligari” – a face full of the contradiction’s that the title “Another Day” may conjure up – both good and bad. The balloons represent just how we can be blown either way throughout life. The sleeve I feel was a forerunner for many of the direct or starkly impressionistic images that would appear on their later photographic sleeves. The back of the sleeve was also redrawn, but the handwriting is Bono’s own.